When emergency medical services (EMS) personnel and related care providers go to work, every second can mean the difference between life and death. Because each second counts, EMS personnel often need to make decisions in the heat of the moment while on site dealing with an accident or another emergency. For EMS personnel to make the best decisions, though, they need real-time access to the most current information about a patient, once he or she has been identified. There’s simply not enough time to search for a missing file or incomplete information when the delivery of proper care is most critical. That’s why it’s important for advanced care planning documents to be automatically served up in EMS workflows. 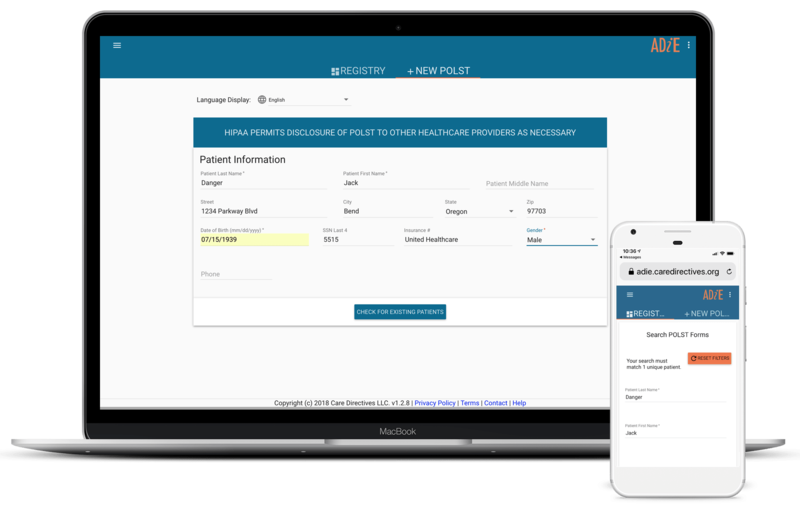 Care Directives’ Advance Directive Information Exchange (ADiE) gives EMS providers and personnel an interoperable, cloud-based repository that easily fits into their existing workflows to deliver vital patient records where and when they’re needed most. As a result, ADiE can serve up a number of advance care planning documents, such as POLST/MOLST forms, Advance Directive, and related end of life care planning documents. Therefore, EMS personnel can easily call up these documents while at the scene and make more informed care decisions, based on patients’ treatment preferences and requests.